Are your canine patients suffering from arthritis, joint pain, fever, or soft tissue discomfort? 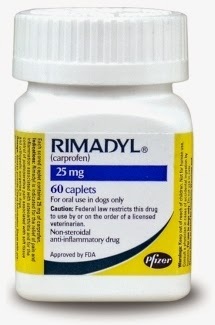 Rimadyl (Carprofen) for dogs is a top choice among veterinarians. Below is an overview of how Rimadyl works, dosage and administation details, and purchasing options. Please note, we only sell this product to licensed veterinarians and pharmacies. If you’re interested in ordering this product and your license is not already on file with us, you may fax it to 800-640-3274. When Should You Prescribe Rimadyl for Dogs? Rimadyl is known as an NSAID, or Nonsteroidal Anti-Inflammatory Drug. It is distinguished from steroids due to its ability to act as an analgesic without inducing the same harmful side-effects that steroids or other narcotics can induce. In short, Rimadyl has a similar chemical makeup to over-the-counter human medications like aspirin, ibuprofen, or naproxen. However, many human pain medications, like aspirin, can be toxic to dogs, so Rimadyl (carprofen) was developed as a safe alternative. Although Rimadyl is most commonly prescribed to manage arthritis pain, its anti-inflammatory properties also make it a natural fit for dogs who are experiencing any type of joint pain, including post-surgical pain. We highly recommend putting any dog who shows signs of osteoarthritis – stiff walking, limping, yelping or whining, or a general decrease in activity – on a consistent prescription of Rimadyl. This drug, which has treated 24 million dogs since it went on the market in 1996, is the most popular arthritis medication prescribed by veterinarians. The general recommended dose of Rimadyl is 1 mg per pound of body weight, given twice daily. Because many joint problems – especially arthritis – are chronic and progressive, it is best to keep the dog on a consistent regiment of the medication. The tablets are chewable and generally well-tolerated by dogs, which means you can feed them by hand or place them on top of the dog’s food. As with any medicine, monitor the dog to make sure he actually ingests it; some dogs can be clever about spitting the medicine out or eating around a pill. As with any medication, side effects are possible. The most common include decreased appetite, vomiting, and diarrhea. The owner should carefully monitor their dog for these and other unusual signs as the dog begins taking the medication. We offer several convenient, affordable purchasing options if you’re ready to order Rimadyl. Tablets come in common dosage sizes like 25 mg, 75 mg, and 100 mg, and we sell containers of up to 180 per bottle. We also offer both capsule and chewable varieties. This drug can only be sold to licensed professionals. Order today and help your four-legged patients start feeling the relief they deserve! The holidays are one of the best times of the year – and chances are, your curious pet agrees! They’re probably noticing a lot of changes taking place around the house, including fun new scratching posts (Christmas trees), toys (tinsel), and a surplus of holiday company that they’ll get to charm into feeding them table scraps. That said, it’s not all fun and games. Whether you own a dog or a cat, careless holiday mistakes can pose a serious threat to your pet. So follow our holiday pet precautions and make sure Fido enjoys his Christmas day chewing on his brand new bone, not taking a trip to the vet. You’ll want that mistletoe hanging overhead anyway, but do keep in mind that this charming holiday tradition poses a major toxicity threat to pets. Both dogs and cats who ingest mistletoe risk intestinal upset, seizures, a serious drop in blood pressure, breathing problems, and even death. So make sure this popular plant is well-secured. Holly and poinsetta plants, too, are extremely toxic. Keep them high up and tightly-secured, and call a vet immediately if your dog or cat ingests something. We all remember that scene from “National Lampoon’s Christmas Vacation.” While things may not end that terribly, it’s a fact that Christmas trees, though beautiful, are also a dangerous source of curiosity for both cats and dogs. And why wouldn’t they be? There are things to climb, ornaments to bat, and there’s tree stand water to imbibe. Unfortunately, in addition to being an annoyance for humans, this is also extremely dangerous. Pets can cause electrical fires, knock over the trees, ingest harmful materials, and more. We’d suggest setting up a baby gate or another barrier around the entire tree to keep it – and your furry loved ones – safe. Pet owners instinctively know to clean up after themselves and keep chocolate and other temptations out of reach. Not so for visiting guests. Make sure your guests know that after they open their stocking and their other presents, they should keep them safely on a table or shelf. Otherwise, their favorite new sweater might just become your dog’s favorite new chew toy. We do not condone feeding your dog from the table, but putting some leftover ham or gravy in their dish can make a wonderful holiday treat. Just know which foods your dog can and cannot ingest. Definite don’ts include: raisins, currants, sweets and sweeteners, and, of course, chocolate. And as much as you might want to give them the fat you’ve trimmed from a piece of meat, fatty foods can also cause serious digestive upsets. Instead, choose a lean meat or a small helping of sweet potatoes sans butter. The golden rule here is: everything in moderation. Anything your dog is not used to may cause an upset stomach. If you’re a cat owner, you may have given up on tinsel long ago. Cats absolutely love this shiny, dangly “toy.” Unfortunately, it can cause serious damage to a cat’s digestive tract. Holiday ribbons and foil-like wrapping paper is also a serious problem, so clean up as you go. Pass a recycling or trash bag around as your guests open their gifts, and allow them to deposit their wrapping paper and ribbons directly into the bag. As a bonus, this will help you avoid the chaos of clean-up later. So enjoy your holidays, be safe, and make sure to pick up an extra-special bone or catnip mouse for your four-legged loved one. 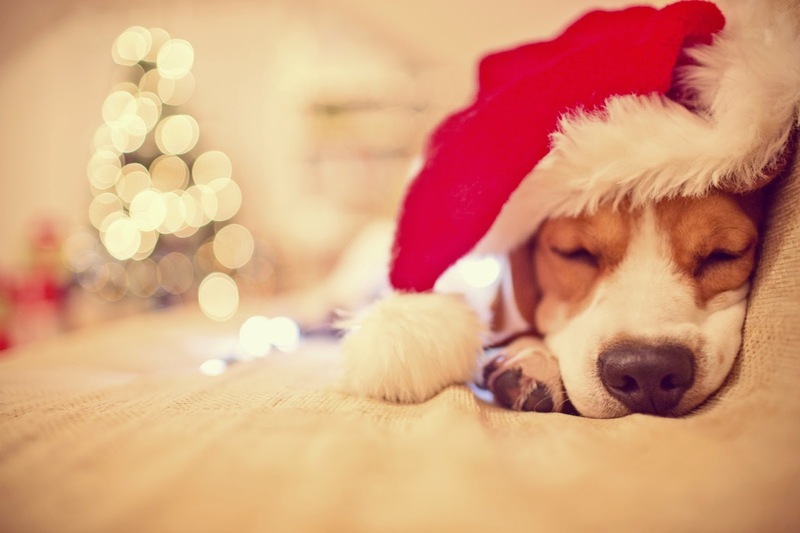 Happy holidays from Medi-Vet!